Dr. Lovaye Kajiura’s connection to McMaster University’s Biology Department is deep and longstanding. She first became interested in Biology as a high school student when she worked as a laboratory technician, research assistant, and teaching mentor. She chose to do her undergraduate studies at McMaster University because of its excellent academic and research reputation. In order to fulfill her dream of getting a Ph.D. and teaching at the University level, Dr. Kajiura pursued her Masters and Ph.D. studies. Working with Dr. David Rollo’s research team, she examined organismal ecology, resource allocation, the impact of biotechnology on physiology, endocrinology, nutrition, and behaviour using the transgenic rat growth hormone mouse model. Since becoming a faculty member, Dr. Kajiura has focused her abundant energy towards coordinating and teaching 1st, 2nd, 3rd, and 4th year undergraduate courses. She is strongly devoted to the scholarship of teaching and learning. She has published integrated case-based studies, examined the linkages between technology and learning, peer mentorship, and interdisciplinary collaborations. Dr. Kajiura is one of the co-leaders of the McMaster IMPACT (Interdisciplinary, Mentorship, Practical, Applied, Community, Transformative) Initiative. Dr. Kajiura (Biology) along with Dr. Robert Fleisig (Engineering), Dr. Brenda Vrkljan (Occupational Therapy), and Dr. Liz Hassan (Engineering) lead innovative interdisciplinary collaborative projects. The IMPACT Initiative engages Science undergraduate/graduate students, Engineering undergraduate/graduate students, Occupational Therapy graduate students, McMaster Alumni, Medical students, Community Healthcare Partners, and real volunteer clients. Students from diverse academic disciplines collaborate to understand, appreciate, and address challenges experienced by our aging population and people living with disabilities. The IMPACT Initiative creates devices to improve the quality of life of clients living with arthritis, dementia, cerebral palsy, aphasia (strokes), and other conditions. This interdisciplinary exchange of ideas and application of knowledge successfully creates meaningful learning experiences that lead to positive community change Dr. Kajiura is also a founding member and steward of the Ontario Consortium of Undergraduate Biology Educators (oCUBE) and leads the McMaster Mentorship Outreach Student Team (MMOST). She attributes academic and professional success to a commitment to life-long learning, thinking long-term, and always being prepared with back-up plans. She believes that perseverance, leadership, strong work ethic, and having a positive attitude are keys to success in every area of life. Dr. Kajiura will always be “your mentor for life”. Biology 1A03 covers the structure, molecular composition, and function in sub-cellular and cellular systems. Biology 1A03 is designed for students who intend to specialize in Science programs and is required for many higher level courses in the Faculty of Science. Upon completion of Biology 1A03, students will be able to: 1. Effectively discuss the fundamental concepts and underlying processes related to cellular and molecular biology, 2. Implement laboratory technical skills necessary for biological sciences, and 3. Work independently and in collaboration with others to compile, analyze, interpret, and present scientific data using oral, written, and internet formats. The primary goal of the course is to prepare students academically for subsequent, specialized Biology courses and to ensure that students acquire skills essential for upper-level biology courses and biology-related fields of study. Biology 1M03 explores the fundamental evolutionary and ecological concepts with particular reference to biodiversity and human evolution. The curriculum examines the dynamics of species diversity and explore the evolution and impact of humans. Emphasis is placed on evolution, ecology, behaviour, and conservation as related to the gain and loss of biodiversity. The PBL (problem-based learning) tutorial (dry lab) activities reinforce the lecture topics and develop skills facilitating the interpretation of scientific observations. The course is a prerequisite for many programs and most relevant to those focusing on evolution and ecology. The Advanced Topics in Ecology course focuses upon the examination of current topics in ecology, including ecosystem & landscape ecology, evolutionary ecology, and behavioural ecology. This course instructs collaborative research teams of students. Students conduct projects designed to enhance their knowledge of advanced areas of ecology. Course assignments and projects involve compiling and summarizing an extensive literature review, development of oral presentations skills, reflective journals, formulation of critiques (constructive feedback), and writing inquiry guided in-depth integrated reports using a fusion of both problem based learning PBL and Inquiry learning approaches. This course is multidisciplinary and holistic with the emphasis on face-to-face in-lecture discussions and is application-based. Students will develop their analytical, critical thinking, problem solving, presentation, ecological research literacy, and collaborative research skills. 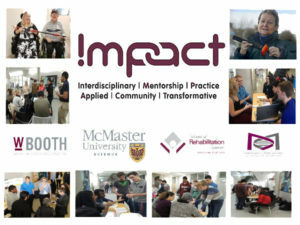 The IMPACT Initiative is an interdisciplinary collaboration that engages undergraduate and graduate students from Engineering, Biology/Science, Occupational Therapy, and Medicine, McMaster Alumni, Community Healthcare Partners, and volunteer clients. The IMPACT Initiative involves a learning process whereby students from different academic disciplines come together to understand, appreciate, and address challenges experienced by our aging population and people living with disabilities. IMPACT co-leaders Dr. Robert Fleisig (Engineering), Dr. Lovaye Kajiura (Biology/Science), Dr. Brenda Vrkljan (Occupational Therapy), and Dr. Liz Hassan (Engineering) teach students how to improve the lives of our aging population and that of people with disabilities. The IMPACT project drives student creativity, innovation, and community engagement. The interdisciplinary exchange of ideas successfully creates meaningful learning experiences that lead to positive community change. ., Kajiura, L., Fleisig, R., Vrkljan, B, & Hassan, L. (2018). Facilitating IMPACTFUL Learning Initiatives via Online Multimedia Tools. Presented a peer reviewed presentation at the Learning & Technology Symposium – Making Blended Learning Work, McMaster University, Hamilton, Ontario, Canada. October 10th 2018. More Connecting with Less Boundaries: The Ontario Consortium of Undergraduate Biology Educators (oCUBE) Model. Workshop presented at the Western Conference on Science Education (WCSE), Western University, London, Ontario, Canada, July 9th– 11th 2013. IMPACT Project – featured story covered by the Canadian Broadcasting Centre (CBC) News Network – The National Dec 28th 2016. McMaster University Daily News Article related to the IMPACT Project collaborative project with Engineering, Biology, and Rehabilitation students.